6. Intelligent PLC controlling system. Gimbal support for the slider cylinder. The whole rotor is processed on CNC, which can make sure the higher precision. Each Rotating-blade has four cutting edge, can rotate 90 continue to use after wearing; Each stator has two cutting edge, can rotate 180 continue to use after wearing; which strengthen the replace ability of the blades and use period, reduce the cost as well. Equipped with castor for easy moving from bottom of the shredder machine, which give a great help for maintenance. Manual and automatic operation model. Enables the toughest of application options. 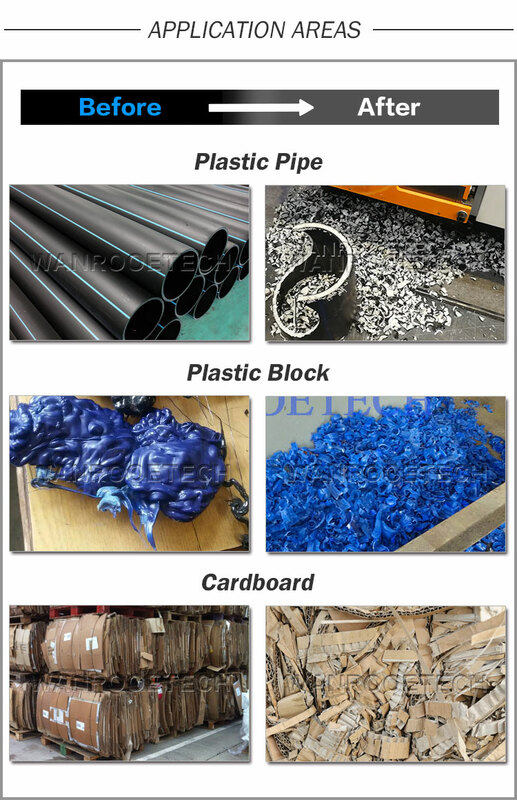 •Plastic: plastic block, plastic sheets, PET bottle, plastics pipe, plastic container, plastic drums.